"Uniting premium chocolate enthusiasts and our beloved doughnut fans, these doughnuts offer an OMG-worthy reward any time of day – whether you’re celebrating life’s everyday moments or in search of a delightful afternoon indulgence"
WINSTON-SALEM, N.C.--(BUSINESS WIRE)--Two of the world’s most indulgent treat creators – Krispy Kreme Doughnuts and Ghirardelli – are combining the indulgence of premium Ghirardelli chocolate with the deliciously satisfying taste of Krispy Kreme doughnuts. The result is the ultimate OMG moment – “OMGhirardelli,” that is. 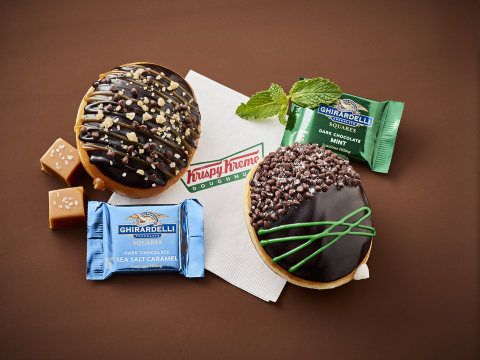 Beginning April 3, Krispy Kreme’s new Mint Chocolate and Sea Salt Caramel doughnuts inspired by Ghirardelli’s popular chocolate Squares will be available for a limited time only at participating Krispy Kreme shops in the United States and Canada. 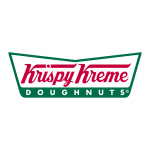 “Uniting premium chocolate enthusiasts and our beloved doughnut fans, these doughnuts offer an OMG-worthy reward any time of day – whether you’re celebrating life’s everyday moments or in search of a delightful afternoon indulgence,” said Jackie Woodward, Chief Marketing Officer of Krispy Kreme Doughnuts. 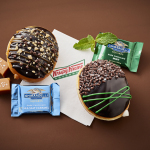 Designed to deliver a treat experience unlike any other, these limited-time doughnuts mean Krispy Kreme guests no longer have to choose between sweet or salty, chocolate or pastry. A cooler combination, Krispy Kreme ’s Mint Chocolate Doughnut Made with Ghirardelli features a doughnut filled with White Mint Kreme™ filling inspired by Ghirardelli Chocolate Mint Squares, dipped in chocolate icing, decorated with green colored icing and topped with Ghirardelli mini chocolate chips dusted in powdered sugar. Again, the chocolate icing is made with premium Ghirardelli ingredients.